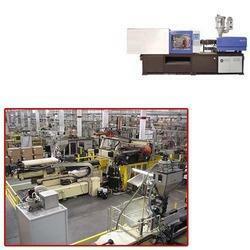 Prominent & Leading Manufacturer from Ludhiana, we offer plc injection moulding machine for plastic industry. We feel proud to introduce ourselves as the leading manufacturer, supplier and importer of PLC Injection Moulding Machine for Plastic Industry. Owing to their Auto trip-off facility in case of motor overload, precise fault & interlock indication & low pressure mould protection, provided machines render great usability. Offered machine is manufactured by making use of supreme quality components and the pioneering technology in adherence with the industrial norms.